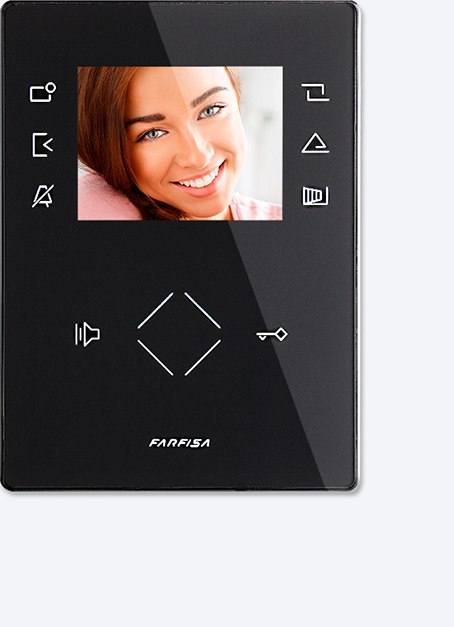 ZHero, essential design and easy to use, fully demonstrates the character of the new generation of Farfisa products. 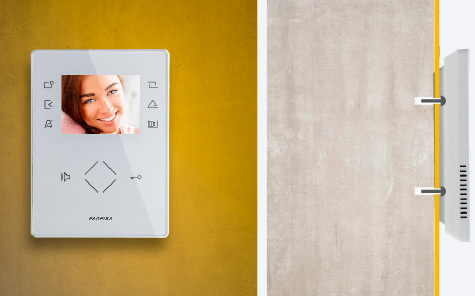 Designed to be surface wall mounted, thanks to its reduced depth, ZHero is discreet and adaptable to any environment: residential, business or entertainment. Available in total White and total Black, ZHero suits any architectural and furnishing style. The new monitor uses the best technology of DUO System, the most evolved and versatile amongst all types of installation, while the technology, advanced, modern and powerful, allows the use of only two non polarized wires for even very large installations. The whole range of outdoor stations is fully compatible with ZHero: from flush or surface mounted solutions up to the IP rated anti-vandal series, Matrix Style. Also ZHero takes full advantage of the OSD system to plan and organize operations details and the 3.5” display parameters. The soft touch buttons allow you to easily govern access to the menu and easily operate the functions that are most often used. 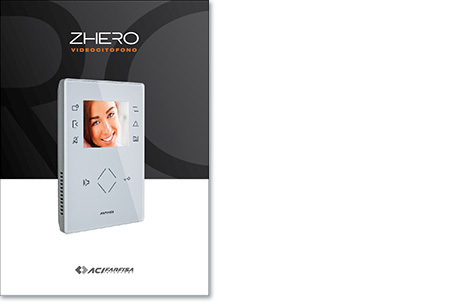 In order to achieve an aesthetic with simple and minimal shape ZHero is equipped only with soft touch buttons. 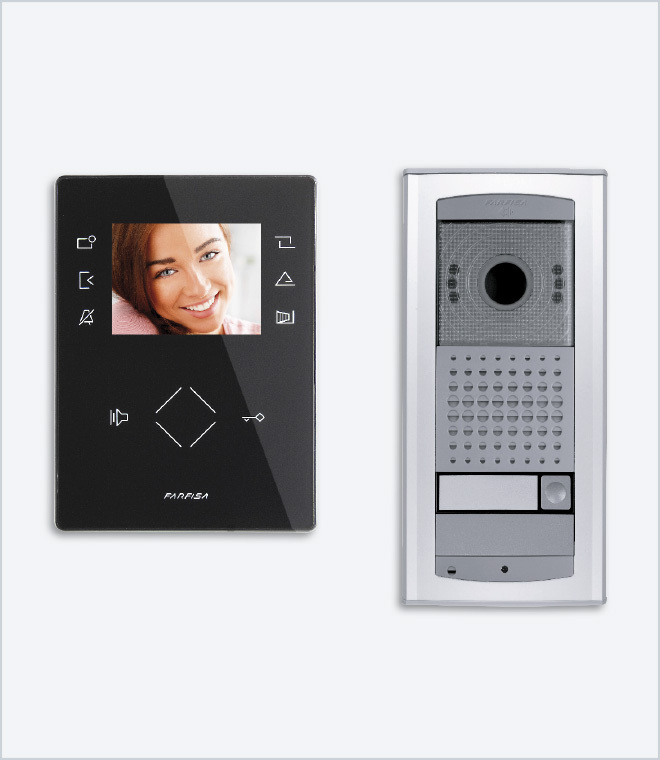 The simple touch of a finger activates the fundamental functions including opening the line for conversation, the electric lock release, auto switching over of configuration and the on-screen programming guide. 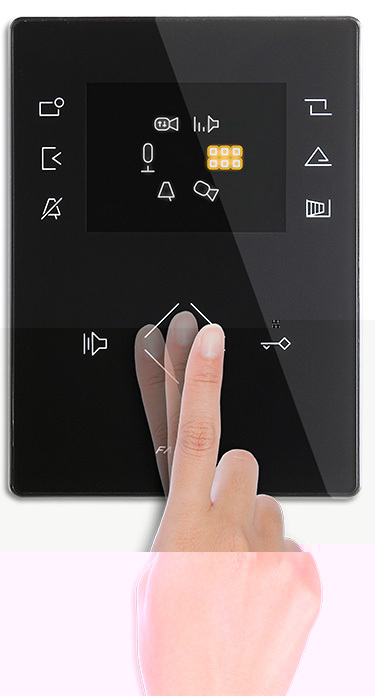 The soft touch buttons scan and activate properly the items displayed in sequence. Graphic icons are neatly displayed on the monitor to identify the soft touch buttons, they are backlit in white to allow immediate and precise configuration, management and operation of the system. 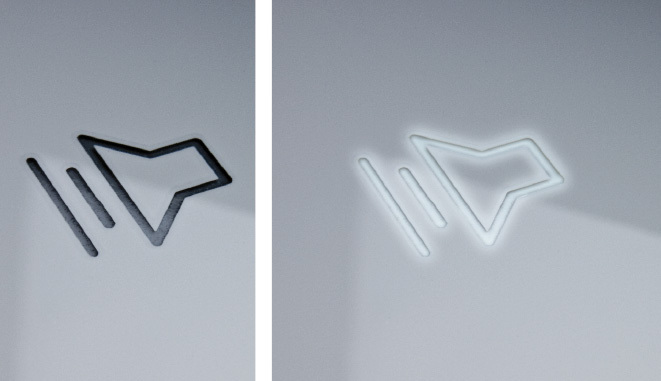 Moreover the modern lines are highlighted emphasizing the minimalist elegance of ZHero. 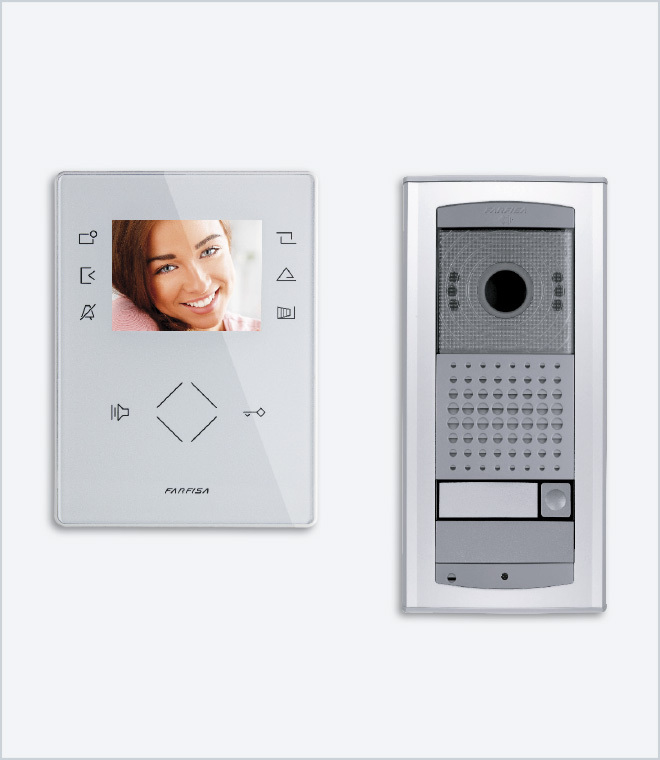 It’s an extremely advanced and flexible system for handling calls that can be from the door station(s) or from other monitors using the intercommunicating function. Thanks to the ESP system (Enhanced Sound Processing) the result is a high quality sound of the selected motif, it’s also extremely flexible offering the possibility to update the sounds and music coupled to the various call moments. The phases of programming, configuration and customisation of ZHero are driven through each step into the LCD screen. A further support that makes ZHero an apparatus that takes full advantage of the great potential provided by its firmware. Fully exploiting the benefits offered by DUO System only two wires are needed for the realization of even complex systems and, if required, completed by a switchboard service. The simplicity of the system and the fact that the ZHero wall mounting is very fast, not requiring wall cut-outs, allows us to say that the realization of the installation as a whole is rapid, clean and virtually without any potential errors. One way colour video kit with ZHero monitor in white and Agorà Light door station. 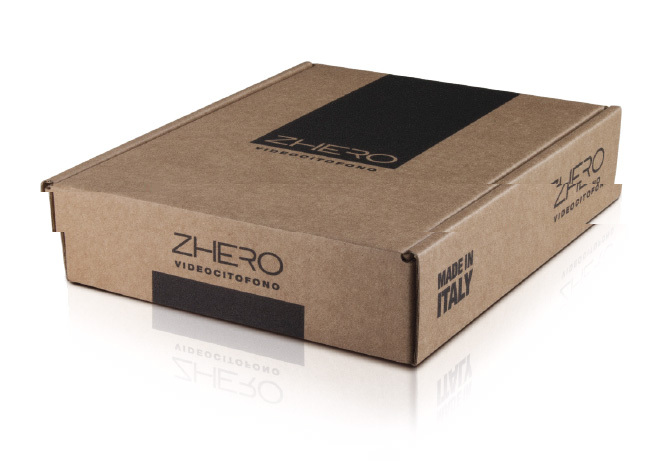 One way colour video kit with ZHero monitor in black and Agorà Light door station. The flush wall mounting is achievable thanks to the metal bracket (supplied with the product) and the use of two screws that guarantees secure wall fastening. The extremely thin profile from the wall helps to make ZHero a discreet element that integrates easily into any environment.